This was a dip I made for my very good friend, Becky‘s housewarming party. I forgot to post this in a timely manner, it’s almost too easy to be a recipe. But if you’re looking for a good salsa recipe that doesn’t depend on summer produce, this is a good one. This is also great mixed in with scrambled eggs if you have leftovers. Per usual I made way too much, so I’ll reduce the quantity below. Still seeking tips on how to estimate quantities for groups. Other highlights from the housewarming were Becky’s delicious Pumpkin and White Chocolate Cookies and life-changing Nutella Fudge. Clearly it was well-fed and joy-filled house! 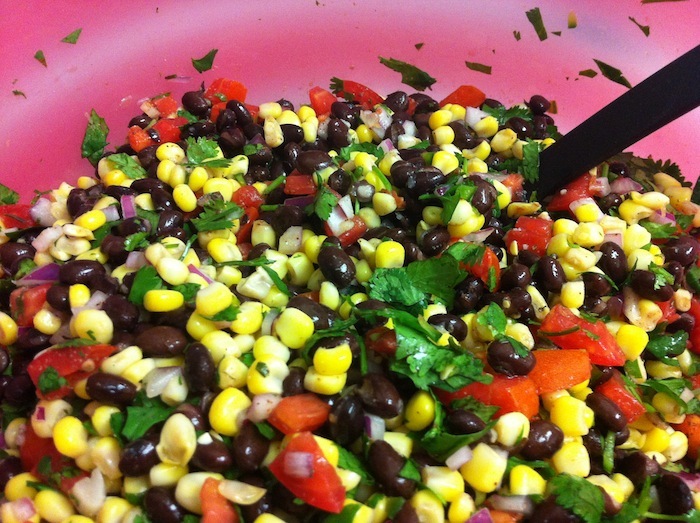 In a large bowl combine beans, corn, tomatoes, onion and cilantro. In a small bowl, whisk together lime juice, vinegar, cumin, salt and pepper. Combine and let sit for at least an hour to allow flavors to meld.